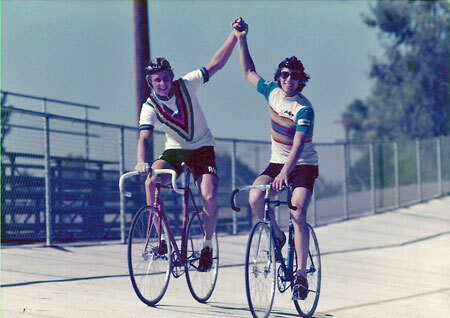 While we all know about the Hellyer Park Velodrome in San Jose, there’s a lot more to the history of track racing here than you’d ever know. Thanks to Tracy Delphia, we have a fairly good history of track racing. Tracy wrote about the sport for her master’s degree as San Jose State. It’s our good fortune to have this excellent paper available online. It’s no surprise Tracy talked to Clyde Arbuckle, a walking encyclopedia about San Jose history in his day. He’s no longer with us, nor is his son. It’s too bad because they were both cycling authorities. Most of her paper focuses on the short-lived but popular Garden City Velodrome (1936-1940) located at Wabash and Olive avenues, next to present-day Abraham Lincoln High School and the Rose Garden. I’ve watched a few races at the Hellyer track. It’s a blast to see the riders speed around the concrete oval but the location in south San Jose doesn’t lend itself to drawing a crowd. I wish it were closer. This entry was posted on January 4, 2012 at 8:08 pm and is filed under History. You can follow any responses to this entry through the RSS 2.0 feed. You can leave a response, or trackback from your own site. Hey, thanks for the kind words on my thesis 😉 I had the good luck to have many of the folks who raced at the Burbank velodrome still around at the time I researched my thesis. They shared a lot of material with me – private photo albums, clippings, and even better – their stories and memories. Clyde was a gem as well – I’m so glad I chance to talk with him. San Jose is fortunate to have such a rich track racing history!